In this guest post, Bart IJntema, Senior Vice President, Food & Agricultural Development at Rabobank International, explains how African agriculture’s current yield gap can be narrowed by investing in supportive initiatives across the supply chain. In Future of Farming, a book recently published, Rabobank asserts that productive agricultural areas aren’t simply those with the best climate or soil quality, but rather those with the best social enabling environment. In other words, if famers are to achieve the full potential of the soil and the climate, they need to farm in countries that have supportive government policies, functioning agricultural markets, access to finance, access to knowledge, and public expenditure on agricultural R&D. But does this really matter? Yes is the short answer. With the UN predicting that by 2050 the world’s population will have grown to nine billion people, it matters to all of us. And if we’re to successfully feed the additional two billion people sharing the planet with us by 2050, we need to help empower the pockets of the world that are not yet producing as much food as they could: a prime example being sub-Saharan Africa. The African continent combines the greatest need with the biggest potential. Population growth in sub-Saharan Africa is set to outweigh growth in developed regions significantly, which simultaneously demands more food yet provides more young farmers to produce it. This requires global Food & Agriculture (F&A) companies to engage more with the region, by acting as catalysts in Africa’s F&A development. The soil and climate of northern Europe are not of the highest quality, but, thanks to access to knowledge and finance, the actual yield is very high. In Africa, which has abundant fertile soil and a good farming climate, it is quite the reverse. 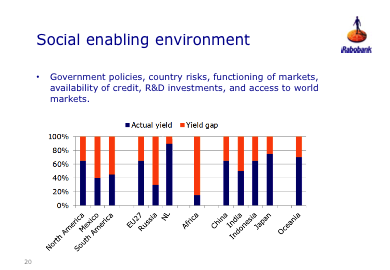 According to Rabobank research (see graph below), sub-Saharan countries could increase their yields by a factor of four, given the right support. The time has come for Global F&A companies to act on this opportunity. Investing in Africa has long been considered a risky choice and has been set aside in favour of other opportunities elsewhere in the world. Global companies now need to take another look at the continent, with a fresh mind-set and a realistic long-term perspective. By partnering with regional and local players to make key investments, the continent can be helped to grow more rapidly and realise its unquestionable F&A potential. In return, companies that make this commitment and get it right have much to gain in terms of increased profits and a new market. While developing and implementing a viable strategy for entering the African market may not be straightforward, it will provide vast rewards if done correctly. Companies will need to identify the opportunities that fit with their capabilities and ambitions, and find the right partners in order to adopt an Africa-centric approach to the market. It will also require confidence in order to develop a presence in the African market. This will require time, effort and capital. Yet the opportunities are there. Rapid urbanisation is leading to consumers’ growing and changing needs. Africa’s enormous untapped agricultural potential is unmatched in the rest of the world and could be the key to making Africa prosperous, resilient and a source of food for the rest of the world. By acting together with all parties in the chain we can make this happen.